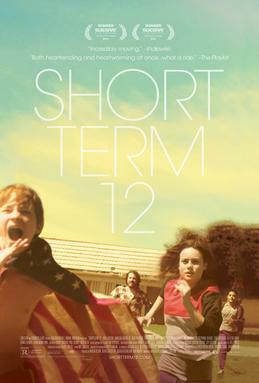 I saw Short Term 12 last year but with it being recently added to Netflix instant I thought it would be a good time to revisit this wonderful little film. This is a very simple character driven story that speaks to the truths of being a young adult in an honest unflinching way that is sadly rare. Most films condescend to teenagers and handle their stories in a shallow manor that feels false. Most of the film is set in a foster-care center for wayward teenagers and is based on the real life experience of Writer/Director Destin Danel Cretton. The film opens with an amusing story being told by Mason (John Gallagher Jr) a veteran employee who is helping a new employee understand how unpredictable his new job will be. Grace (Brie Larson) is a young counselor barely older than the children in her care. She is profoundly empathetic to the residents of the facility and does everything in her limited power to bring some comfort to their chaotic lives. This film doesn't deal with life or death stakes on global level. You will not see giant robots manipulating alternative fuel sources to make bombs to blow up a national monument. No, this is a film with real stakes. Emotionally grounded, real world stakes that anyone can relate to. The film itself is not glossy or filled with any fluff it is bare bones and raw. Characters make poor choices and say things that hurt the ones that try to help them. Its not often I'm moved to tears when watching a film. Ok, that last sentence was a flat out lie. I cry very easily. Sometimes I cry at films that aren't very good. That's just who I am. Where was I? Oh yeah, Somewhere around the one hour mark I could feel this story underneath my skin. It had gotten to me and I was emotionally invested in its characters. When I give into a movie like this a small part of me gets nervous, I continue with trepidation because I've seen far too many films fall apart in the final reel. This is not one of those films. You can enter it with an open heart and it will not let you down. I was deeply moved by this film the first time I saw it and it held up wonderfully to the second viewing. Brie Larson is simply one of finest young actors working today. With films like 21 Jump Street, Short Term 12, The Spectacular Now and television appearances on Community and The League she has shown great range and skill for such a young actress. This film has a score of 8.0 on IMDB a 99% fresh ratting on Rotten Tomatoes and metacritic score of 82% so I am not alone in my praise of this film.